Are you an ExecuKID? Do you have an ExecuKID at home? If so, then you know the daily challenge of meeting fierce independence with responsibility! This Life Planner was made JUST FOR YOU! With the input of other ExecuKIDS just like you – to keep life in order, remember all of those things that adults keep reminding you to do and ROCK the school year! Parents – I understand how frustrating it can be to stay on top of the kids to do their homework, plan for a project, turn assignments in on time, remember to take things to school and to bring them home afterwards! I get tired of nagging at them and they get tired of hearing it, so we made a planner that will work with them – to help teach responsibility and give them independence, building confidence to do well in school and in life. Give your children the tools they need to be successful and build Executive Functioning skills that will prepare them for school and years to come. 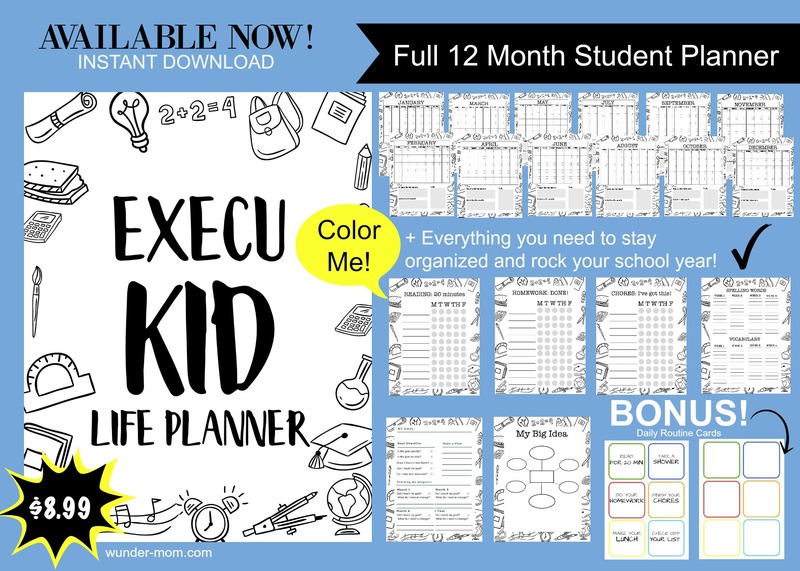 This is a complete student planner for the school year to help them organize their schoolwork, homework, responsibilities, and goals! Printable routine cards with daily routines and editable extras to add in your own cards. Made to be printed, laminated, and added to a single binder ring – just flip through them to make sure you haven’t forgotten anything on your way out the door! **PLEASE NOTE: This is a digital item that will need to be downloaded and printed.